According to the Vera Institute in 2017, people with disabilities are at least three times more likely to be sexually assaulted than people without disabilities. In order to address the extreme need for sexual and domestic violence resources and advocates in the disability community, the Arizona Coalition to End Sexual and Domestic Violence has partnered with Ability360 to provide weekly hours where victims and survivors; friends, family, and other concerned individuals; and staff or professionals working with survivors can freely contact a Helpline Victim Services Specialist. 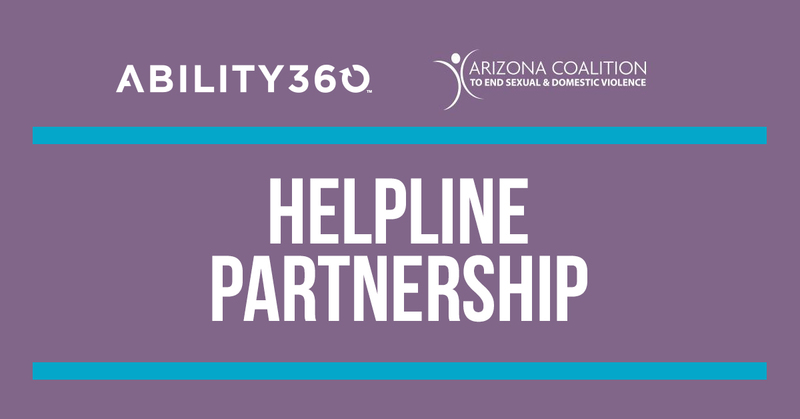 Starting April 18th, every Thursday the Arizona Coalition to End Sexual and Domestic Violence will have a Victim Service Specialist availability at Ability360 Main offices from 4pm to 7pm. The service is free and we hope that the community, including people with disabilities, family, caregivers, service providers, Ability360 Staff, or anyone needing support and services, will utilize the resource. Contact helpline@acesdv.org for an appointment. Need help NOW? Visit the Arizona Coalition to End Sexual & Domestic Violence for phone and online messaging resources.